What is the Next Gen Transit for AWS? What is the Aviatrix TGW Orchestrator? Why should I use Transit Gateway Orchestrator? How does Transit Gateway (TGW) Orchestrator compliment AWS Transit Gateway service? How does Transit Gateway Orchestrator work with Transit VPC? How does the Next Gen Transit compare with Transit VPC? There is AWS CloudFormation and Terraform support for Transit Gateway, why should I use Aviatrix Orchestrator? What is a Connection Policy? What are the benefits of using Security Domains and Connection Policies? How to deploy Transit Gateway Orchestrator? What can be displayed at the View page? What are the Transit Gateway Orchestrator deployment scenarios? Can I change my plan or VPC attachment on Transit Gateway Orchestrator? I already have a Transit Gateway and some VPCs attached to it, how do I migrate? I plan to isolate a Dev Domain and Prod Domain, but there is one VPC in Dev that needs to connect to Prod. What should I do? How does CSR based Transit VPC solution compare with Transit Gateway? 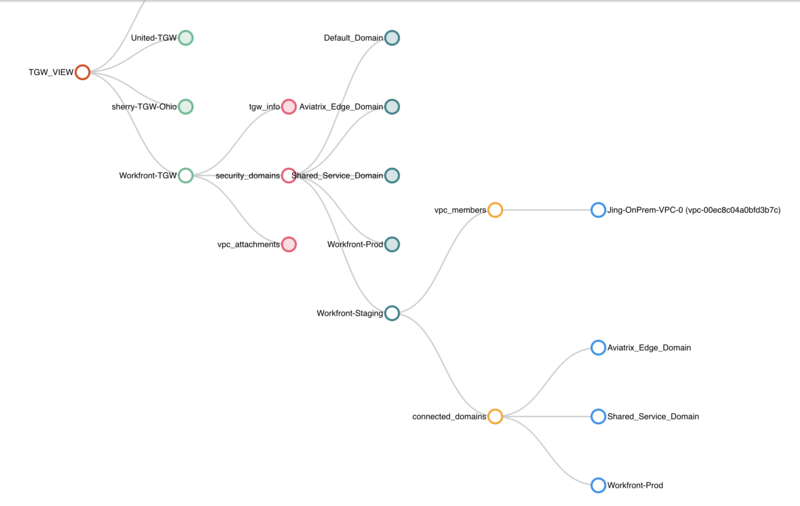 Why should I use Aviatrix Transit Gateway Orchestrator to build a transit network architecture? What value does Aviatrix gateway provide in the Transit Gateway Orchestrator? When a VPC is attached to a TGW, why can’t I simply program the default route in VPC route table to point to the TGW? 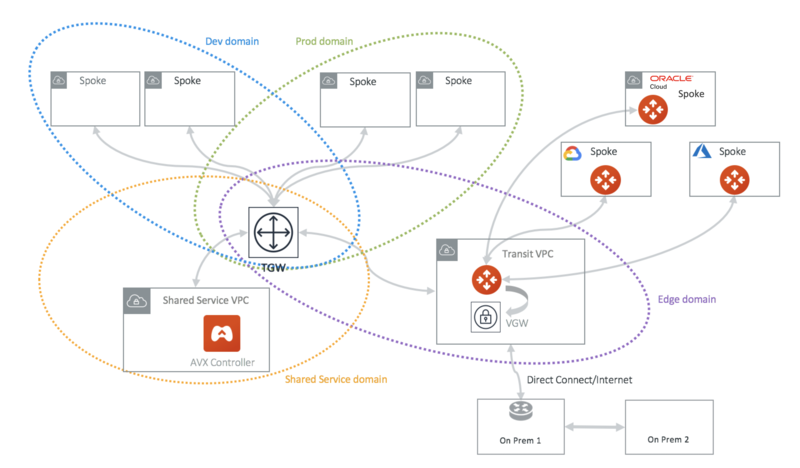 Orchestrates VPC to VPC and on-prem to VPC connectivities via AWS Transit Gateway. Automate AWS Resource Access Manager (RAM) for multi account support. Creates security boundaries between groups of VPCs to achieve network segmentation..
Out-of-the-box integration of AWS Transit Gateway and Direct Connect and Internet to re-use what has been built. Provides Insane Mode high performance and feature rich hybrid network for connecting to on-prem. Advanced mode for end to end encryption where Aviatrix gateways are deployed in the AWS Spoke VPCs and Azure Spokes VNet. The AWS Transit Gateway Orchestrator is illustrated in the diagram below. In the above diagram, AWS VPCs are grouped into four domains: Dev domain, Prod domain, Shared Service domain and Aviatrix Edge domain. Each VPC in the same domain can communicate with each other via AWS Transit Gateway . VPCs in Prod domain cannot communicate with VPCs in Dev Domain, while all VPCs in Dev domain and Prod domain can communicate with Shared service domain and Aviatrix Edge domain. Through the Aviatrix Transit GW in the Aviatrix Edge domain, Spoke VPCs can communicate with on-prem over Direct Connect. In the deployment, the VPC in the Aviatrix Edge domain is a Spoke VPC from Transit Gateway point of view, however it serves as Transit VPC from Aviatrix Transit Network point of view. No Aviatrix gateways are deployed in Spoke VPCs except in the Transit VPC. Aviatrix Transit GW serves as hub connecting to Azure and GCP network. 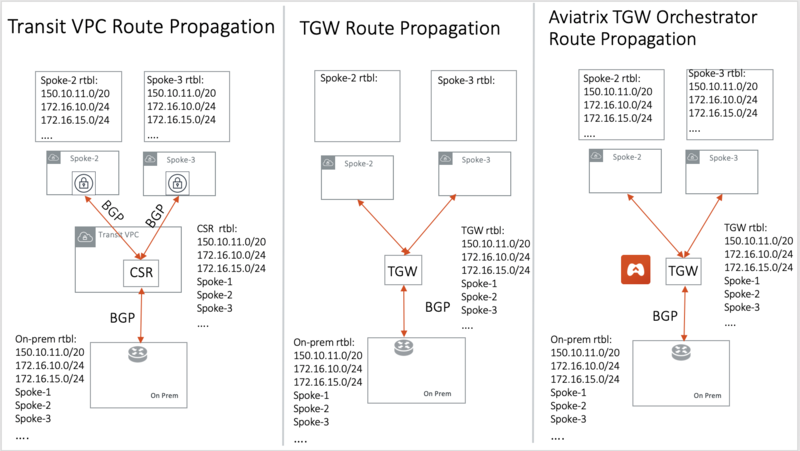 Aviatrix TGW Orchestrator builds the Next Gen Transit Network that includes TGW attached Spoke VPCs. AWS Transit Gateway Orchestrator simplifies, abstracts and extends the latest AWS Transit Gateway service. Aviatrix Controller makes Transit Gateway based Transit architecture deployable by overcome Transit Gateway limitations. Functional Completeness Aviatrix makes AWS Transit Gateway functionally deployable. The Orchestrator programs and updates both VPC route tables and TGW route tables so the routes are dynamically propagated to the Spoke VPCs. Read this answer for more details. Segmentation The Orchestrator abstracts the route domain and route propagation concepts in Transit Gateway that allows you to create network segmentation by policy and intent. Multi Account The Orchestrator automates the AWS Resource Access Manager (RAM) to allow you to manage multi account VPC attachments to TGW. Scaling Aviatrix solution overcomes Transit Gateway route limits to scale the hybrid deployment to hundreds/thousands of VPCs. . Hybrid The Orchestrator extends the Transit Gateway capability to include Direct Connect support for connecting to on-prem datacenter. Multi Cloud Architecture Aviatrix Controller creates and manages a multi cloud global transit architecture with a single pane of glass. Dynamic Route Propagation Using Aviatrix Orchestrator is the only guaranteed way to ensure your on-prem routes are properly propagated to Spoke VPCs. AWS Transit Gateway propagates VPC CIDR and IPSEC VPN routes to the Transit Gateway route table. But the routes are not propagated to the VPC route table. It is account owner’s responsibility to program VPC route tables. Aviatrix Transit Gateway Orchestrator dynamically update route entries in the VPC route tables. Policy Abstraction AWS Transit Gateway provides capability to allow two Transit Gateway route tables to propagate routes to each other, but the actual route entry programming is left to the owner. Transit Gateway Orchestrator builds on that and allows customers to define policies that form a security boundary. Multi Account Support Automate the RAM resource sharing process to seamlessly manage multi account VPC attachment. Troubleshooting Single pane of glass for troubleshooting connectivity with expert diagnostics capabilities. Direct Connect Support AWS Transit Gateway provides on-prem connectivity via IPSEC VPN. It does not support Direct Connect. With Transit Gateway Orchestrator, Direct Connect customers can immediately benefit Transit Gateway service. Traffic Visibility Netflow log support for traffic between on-prem and all VPCs. Stateful Firewall Enforce security policy for all traffic between on-prem and all VPCs. 10Gbps Transit Support 10Gbps Transit network throughput. Transit Gateway Orchestrator leverages the Aviatrix Transit Network workflow for the hybrid connectivity function to on-prem datacenter and branches. It enables Transit Gateway Orchestrator to connect with on-prem over Direct Connect or Internet. Transit Gateway Orchestrator can also be used as a stand alone function for orchestrating VPC to VPC connections. When using Transit Gateway Orchestrator for hybrid connectivity, no gateways are deployed in the Spoke VPCs for hybrid function. Transit VPC refers to transit deployment model where an Aviatrix gateway is deployed in a Spoke VPC. this is now called advanced mode in the Next Gen Transit. Transit Gateway Orchestrator can be deployed with some Spoke VPCs run Aviatrix gateways. When is the right use case to run Aviatrix Spoke gateway? If you need packet in flight to be encrypted, launch Aviatrix gateway in the Spoke VPC. If you need various NAT function between Spoke and Transit VPC, use Aviatrix gateway in the Spoke VPC. If you need to connect a Azure VNet as Spoke, use Aviatrix gateway in the Spoke VPC. If you need to obtain Netflow and log information from the Spoke and Transit, use Aviatrix gateway. If you want to build a fully isolated Transit network where there is no inter VPC connectivity by default. AWS CloudFormation for TransitGateway is a resource construct for Transit Gateway, so is the Terraform example. They are all awesome, but these constructs may not be sufficient to run your network. For example, Transit Gateway does not propagate routes from on-prem to the VPC route table, that means there is no guarantee that your VPC instances can reach a specific on-prem server or host. Even if you hard coded the list of CIDRs to shuffle them down to Transit Gateway, what happens when a new VLAN or Subnet is stood up on-prem. Who is going to notify you? Modern distributed network either requires BGP to dynamically propagate the routes or a controller that dynamically update the routes. Either approach, it is the only way to guarantee the network actually functions. At Aviatrix, we choose a software defined approach with our Controller. Unless you plan to develop a controller like ours, you should consider using our product. Learn more about Transit Gateway limitations from this link. Security Domain is an Aviatrix enforced network of VPC members, where VPCs in the Security Domain can communicate with each other, and VPCs not in the security domain cannot communicate with VPCs in the Security Domain. Aviatrix Security Domain is an abstraction builds upon AWS Transit Gateway route table concept. One or more Spoke VPCs are members in a security domain. VPCs in a security domain can communicate with each other via Transit Gateway. Each security domain has a corresponding route table on Transit Gateway. Aviatrix Controller dynamically programs and updates both VPC route tables so that instances in different Spoke VPCs in the same domain can communicate with each other. Two security domains are not connected, i.e., a Spoke VPC in one domain has no connectivity to another Spoke VPC in a different domain. Connection policy must be specified to connect the two domains so that VPCs in each domain can communicate with each other. A connection policy is an Aviatrix enforced cross Security Domain connectivity rules. A connection policy builds upon the Transit Gateway route table propagation concept, it specifies the connection relationship of one Security Domain to others. 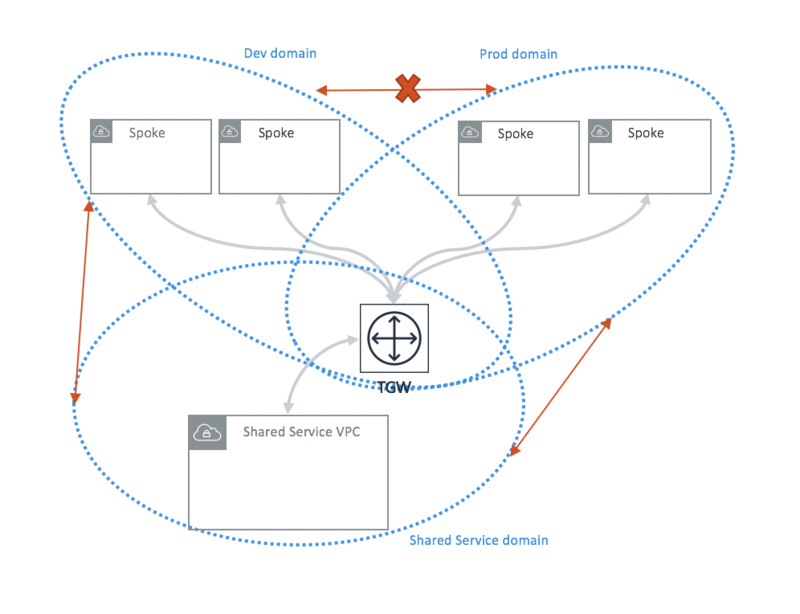 If two Security Domains connected by policy, instances in Spoke VPCs attached to each domain can communicate with each other via Transit Gateway. In the example below, both Dev_Domain and Prod_Domain have connection policy to Shared_Service_Domain. Dev_Domain and Prod_Domain are not connected. Instances of a VPC in Dev_Domain can communicate with instances of a VPC in Shared_Service_Domain. But instances of a VPC in Dev_Domain cannot communicate with instances of a VPC in Prod_Domain. Aviatrix Controller programs all VPC route tables and Transit Gateway route tables so that two Security Domains with a connection policy can communicate with each other automatically. The key use case for building Security Domains is to segment traffic between VPCs, sometimes also called east west traffic. Native Service. It leverages AWS Transit Gateway route domain and route domain propagation constructs. Zero performance impact. Comparing to deploy a firewall instance, this approach has zero network performance impact. Using Security Domains and Connection Policies allow you to identify groups of VPCs with the same requirements from networking point of view and then apply connection policies at the group level. This avoids having to individually specify connections at VPC level. The Aviatrix Controller takes care of route programming of all route tables. One analogy to think of a Security Domain is datacenter VLAN/Subnets and hosts connecting to the VLAN/Subnet. In the Aviatrix Security Domain concept, a security domain is a VLAN, a host is VPC plugging in to the VLAN. Hosts in the same VLAN can communicate with each other. If two VLANs are defined by policy to be connected, the hosts in different VLAN can communicate with each other. When a Transit Gateway is created by the Aviatrix Controller, the Default_Domain is created and a route table corresponding to the Default_Domain is created on Transit Gateway. If you do not plan on building any network segmentation, you can use Default_Domain for inter Spoke VPC and hybrid communications. When a Transit Gateway is created by the Aviatrix Controller, the Shared_Service_Domain is created and a route table corresponding to the Shared_Service_Domain is created on Transit Gateway. You can attach a Spoke VPC to this domain and host your shared service instances such as your DevOps tools. Shared_Service_Domain is always connected to Default_Domain and Aviatrix_Edge_Domain. When a Transit Gateway is created by the Aviatrix Controller, the Aviatrix_Edge_Domain is created and a route table corresponding to the Aviatrix_Edge_Domain is created on Transit Gateway. Aviatrix_Edge_Domain is designated for connecting VPCs managed by Transit Gateway Orchestrator to on-prem network. There must be one VPC attached to this domain. In the VPC, an Aviatrix Transit GW is deployed and used for data traffic forwarding between Spoke VPCs and on-prem network. Aviatrix_Edge_Domain is always connected to the Shared_Service Domain and the Default_Domain. Transit Gateway Orchestrator is deployed in two stages. Plan: Define and setup Security Domains and Connection Policies. Build: Attach a VPC to Transit Gateway and Security Domain. List: List what is programmed in the Transit Gateway route table for a given Security Domain. View: View what VPC members are attached to Security Domains and Connection Policies. Test: instance to instance end-to-end Troubleshoot. ALL Transit Gateway created by the Controller. All Security Domains under a Transit Gateway. All VPC members in a Security Domain. For a given Security Domain, what other domains it connects to. All VPC attachments to a Transit Gateway. For a given VPC, what other VPCs in other domains it connects to. Check out some design patterns that address your requirements. Yes, all stages (Plan, Build, List, View and Test) are modular. You can change your design any time. Unlike VPC where once you have created it and launched instances in the VPC you cannot delete the VPC or move the instances easily, Transit Gateway and its attachments can all be changed without making changes to the instances and VPC CIDRs. Simply detach the VPCs from the current Transit Gateway, launch a new Transit Gateway and build it out again. Aviatrix Transit Gateway Orchestrator manages the entire life cycle of network, including Security Domains, all Transit Gateway and attachments should be created and managed by the Orchestrator. 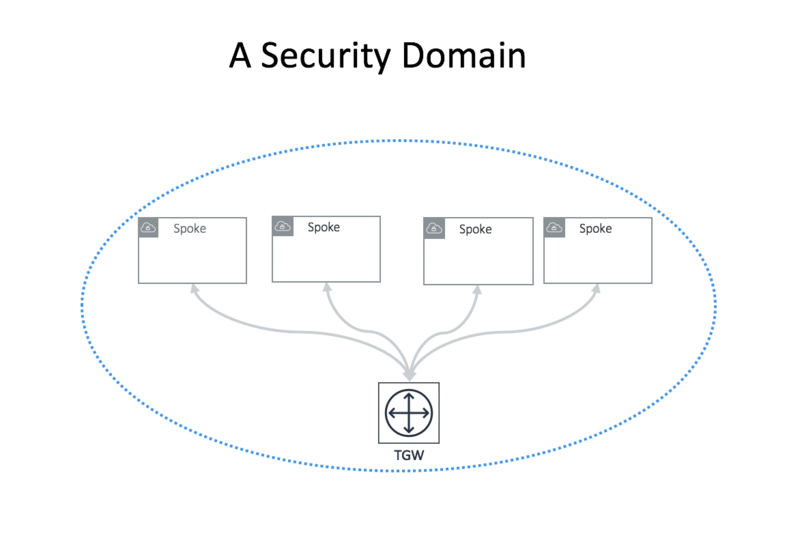 Since you can create as many security domains as you need, you can create one domain and connect this domain to your Prod domain, and if needed, also to the Dev domain. Simply attach the special VPC to this domain, it will have connectivity to Prod domain. Transit Gateway significantly simplifies building VPC connections. But Transit Gateway itself is functionally incomplete for hybrid connection. For example, Transit Gateway does not propagate routes to Spoke VPCs, which means using Transit Gateway alone does not offer a functional hybrid solution. The example below illustrates the how CSR based Transit VPC provides an end-to-end solution while Transit Gateway alone leaves Spoke VPC route table all empty. Not able to propagate routes from on-prem to the Spoke VPCs. Not able to connect with Direct Connect. The Transit Gateway VPN has 100 route limits. Transit Gateway route table cannot summarize routes to advertise to Transit Gateway VPN. While you may think you can gather the on-prem routes and program the Spoke VPC tables, it is not so simple. The on-prem routes change from time to time as new networks are added or removed, which means you need a reliable way to monitor the route changes, handle exceptions, dealing with errors and duplicate routes – essentially a function carried by BGP or an orchestrator. Aviatrix Transit Gateway Orchestrator fulfills the need to propagate on-prem routes to the Spoke VPCs. This function is either carried by BGP or software defined. In the Aviatrix case, it is software defined and performed by the Controller. The diagram below shows how CSR Transit VPC, Transit Gateway and Aviatrix Orchestrator compare for route propagation function. As can be seen, in the CSR Transit VPC case, CSR propagates on-prem routes to Spoke VPC via BGP to VGW; Transit Gateway has no route propagation to Spoke VPC; Aviatrix Controller propagates routes to Spoke VPC through a software defined mechanism. Ensure the correctness of connectivity by monitoring and dynamically programming on-prem network address ranges to Spoke VPCs route tables. Avoid network outage by detecting and alerting overlapping and conflicting network address ranges between on-prem and all VPCs. Avoids AWS VGW or Transit Gateway VPN 100 route limits by summarizing Spoke VPC CIDRs advertisements to on-prem network. Provides traffic visibility by supporting Netflow logs between on-prem network and all VPCs. Provides stateful firewall to enforce policy between on-prem network and all VPCs. Out-of-box integration to support Direct Connect. Connects multi-region Transit Gateway deployment. Supports Transit DMZ architecture by inserting third party firewalls at the edge/transit VPC. Supports 10Gbps Transit network throughput. In some cases, you absolutely can. For example, if you have a group of VPCs that need to be connected to each other, you can attach each VPC to the same TGW route table with propagation enabled. Then program each VPC route table with the default route (0.0.0.0/0) to point to TGW. But in other cases you may not. 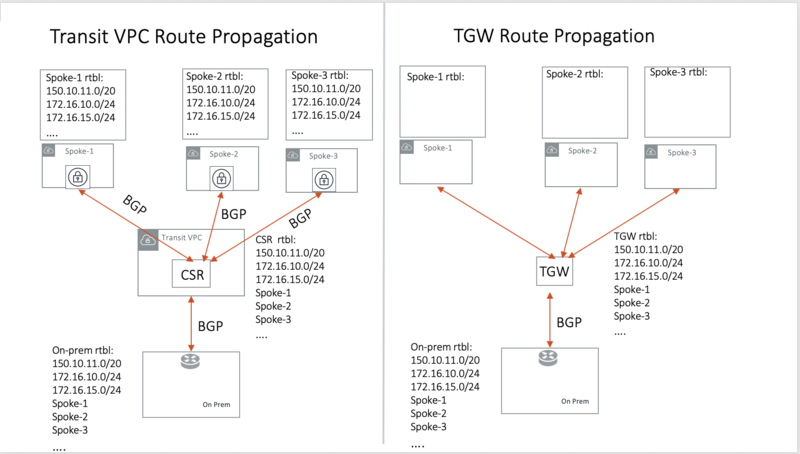 Using the above example, if there is public subnet in a Spoke VPC, then you cannot simply program each route table with the default route pointing to TGW, as a public subnet already must have its default route point to IGW. Even a Spoke VPC route table for private subnet may already have the default route point to an AWS NAT gateway. This is quite a common situation and it happens, you cannot program the default route to TGW. However in the above example scenarios, you maybe able to program RFC 1918 (10.0.0.0/8, 172.16.0.0/12, 192.168.0.0/16) routes of the Spoke VPCs to point to TGW. This is a viable solution you can use to address the issues mentioned above and works in a lot of situations.